It was inevitable that “scientists” would eventually blame Harvey on global warming. Perhaps a more intriguing question is how did its companion, disturbance 92L, come all the way across the Atlantic in a classic arcing path through Florida and up the East Coast and fail to develop? What does that tell us? There is much being made of Harvey and climate change. Meteorologically, as far as the intensity of the storm, let’s see where it ranks among landfalling Category 4 or 5 storms. It’s tied for 14th. Look at the storm above it, Hazel. Now, let me ask you: Which is the more extreme as far as deviation from normal with pressure, which is a good metric to objectively evaluate how extreme a tropical cyclone is — a storm that hit in mid-October in North Carolina, or one that hit the central Texas coast in late August? Let’s also look at Harvey in relation to other hurricanes in Texas. Behind it is the 1915 Galveston hurricane. That is the lesser of the two evils, because the 13th right above Harvey is the 1900 Galveston hurricane that killed 6,000-12,000 people. And right above that one is the Freeport hurricane of 1932. Notice when these are occurring. Then there is the 1916 cyclone in Texas — just a year after the 1915 Galveston hurricane — and Carla in 1961. Again, this all occurred over 50 years ago. Then there is the 1886 Indianola hurricane. They are all hitting in the area that Harvey hit. So the question becomes, if those same storms, almost all stronger, from many years ago hit today, would they be a sign of climate change? Why is Harvey — and not to downplay the storm, but it was one of many and less intense than most — a sign the climate is changing, but these other storms would not be? Harvey got trapped not by an expansive subtropical ridge, as one notable climate scientist claimed, but by an abnormally large-scale trough over the eastern U.S. as can be plainly seen in the five-day means at 500 mb. It dealt with an abnormally cool pattern. That lined up in textbook fashion with Phase 2 of the MJO that was occurring. I jumped all over this on Aug. 21. Here’s the observed reaction in Phase 2 in the tropics close to the U.S. The development of Harvey and the pattern that caused it to stall were all on the table well beforehand for those who looked. However, if you did not look, or you were unaware of previous metrics of strength, then you would fall for the arguments that this is part of climate change. All those other storms continued moving, so they went inland and died as they got farther away from the ocean source. Because either a warmer than normal or normal pattern steered them that way. Harvey stalled because of a pattern that has happened before, was on the charts, and involved the opposite of arguments that would lead to a warming conclusion. The stalling of the storm was key since lesser storms that have stalled in Texas have dumped almost as much rain, the most notable being Amelia in 1978, a mere tropical storm that dumped 48 inches of rain. Naturally, a stronger stalled storm would dump more rain, but what stalled the storm was not a result of climate change but rather a well-known, well-forecasted pattern. So if the 1935 Labor Day hurricane — the most powerful storm to be recorded hitting the U.S.; a storm that went from a tropical storm to a Cat. 5 in 36 hours — occurs again, why would it be climate change now but not then? If the 1938 storm — a storm that took down two billion board feet of trees in New England, caused major river floods in western New England, flooded Providence with 13 feet of water in a storm surge, and had a wind gust of 186 m.p.h. at Blue Hill — occurs again, why would it be climate change now but not then? If Donna of 1960 showed up again — with hurricane force winds in every state from Florida to Maine, never recorded before or since in U.S. history — why would it be climate change now but not then? I can go on and on with countless storms. The answer: It is nature doing what nature does. And coming out after the storm and claiming it’s something else reveals either ignorance of the past or, if you do know, an agenda based on deception. If I saw the people commenting on this now making a preseason forecast, or even five days before when the obsession was the eclipse, then perhaps I would be more open to those ideas. But telling people why after the what is Monday morning agenda-based quarterbacking. Perhaps that is the lesson of Harvey. As we already know from the Podesta hack. We got the vacuous insinuations and assertions at the time, now they are thumping it home. Dubious attribution of ordinary weather events (once correctly called NATURAL disasters) has long been the CAGW’s propaganda weapon of choice. The PTB – those responsible for planning and executing recovery processes for hurricanes have a gift of an excuse for doing nothing: When a hurricane hits they can blame the damage on AGW rather than spend time and money alleviating the misery. And those affected will be willing believers in the claim. Control-freak politicians need to create a crisis first before offering a way – that only they can supply – of saving their grateful voters. Before 2017 alarmists had very little in terms of major US landfalling hurricanes to shout about for years, so now they try to make up for lost alarm time. Of course to them the multi-year absence of severe hurricanes near the US signified nothing apart from a lack of propaganda opportunities. Alarmists have a certain stock of cracked records, which they cherish. Every now and then one will be chosen and played at full volume. Tears will come into their eyes. Mine too, but not for the same reason. Of course, most of the World – or their rulers -does not give a fig for any of it. 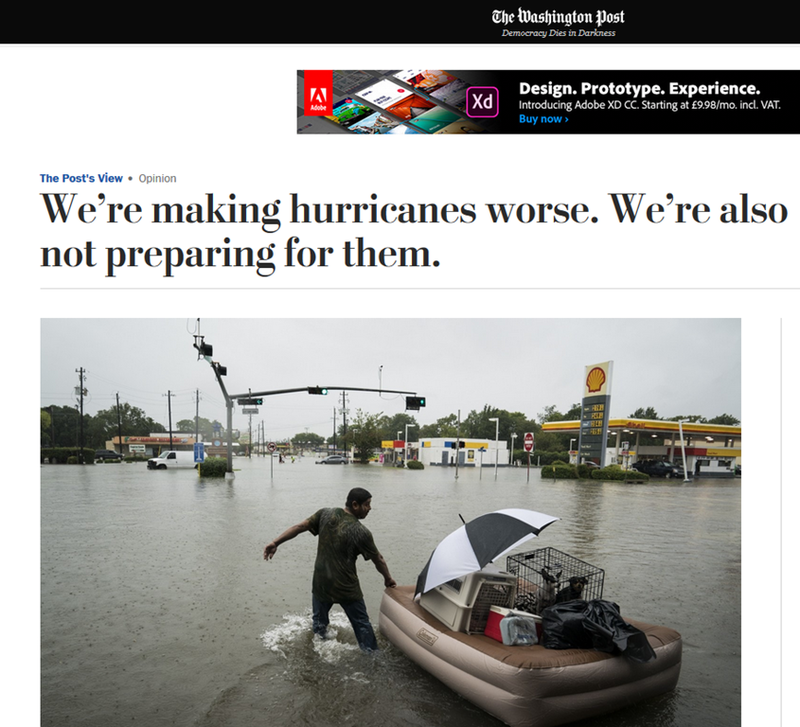 How can the WaPo claim there’s a lack of preparation for the hurricanes? I really don’t need to read past the headline to know it’s garbage. For the alarmist sheep, climate change is global until it’s not. Despite a more active than average Atlantic Hurricane season the 2017 Global ACE emded up nearly 20% below the average. There is not trend since 1970 either in the number of Tropical storms nor in the number of majors. And despite the claims there would be fewer hurricanes but an increased proportion of major storms, the over all number of Tropical storms has continued to correlate very well with the number of major hurricanes. When it comes to hurricanes my concern is the hype about individual storms. Even after it’s brush with the Cuban coasts Irene was being hyped as having strengthened back to a house flattening CAT IV. As it approached the coast of Florida they lowered it to a CAT III and held that classification until well over an hour after it made landfall near Naples, FL. I monitored every ground and weather buoy in the path of the storm in real time during those hours and not a single one showed it to have CAT III winds. I’m afraid there is going to be a price to be paid for the overstating the strength of hurricanes when people begin to not take the warnings seriously. When Mann made that claim about how Harvey was caused to loiter and loop and Joe Bastardi, who is actually a meteorologist, which Mann is not, cleaned his clock publically. 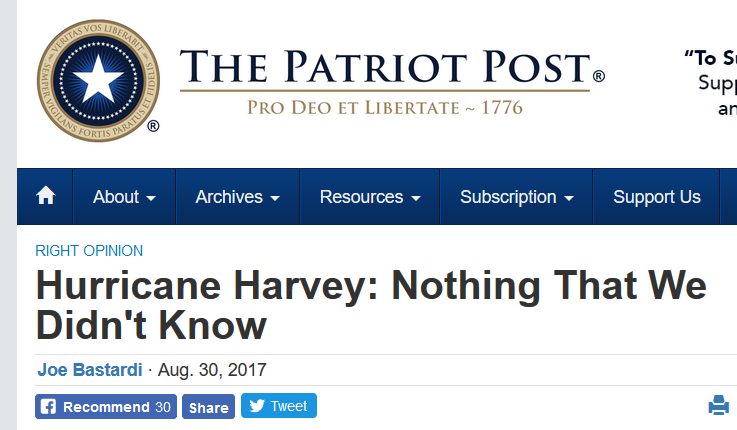 There’s a good article over at “NoTricksZone” that refers to a newly published paper that says Harvey and other recent hurricanes were fuelled by natural cycles, not climate change. Harvey was a hurricane. Weather. It was blocked over SE Texas by weather conditions, such that it rained for several days. Anyone who suggests that Harvey was anything but weather is conspicuously LYING. They are begging the question – if the heat in the ocean made Harvey so destructive, then you have to prove that the heat in the ocean was caused by humans. Just saying humans caused the heat so humans caused Harvey is not science. You have to prove the original claiming which everything is based. BTW the Washington Post has always been biased, but since Trump won the election it has gone off the deep end. Their lies have gotten ever more blatant and they don’t even bother to respond or correct half the time when they are proven to have printed false information. They, like the NYT and the majority of the TV news are in full disinformation mode as they attempt to cover for the deep state and democrats and attack any Republican that supports the president. I have seen nothing like the way it is now in the US press. Speaking of Napoleon at Moscow. One of my favorite pieces of music is Tchaikovsky’s “1812 Overture.” I played it when a member of the WVU Symphony Orchestra during college (oboe). So I know the story line of the music. 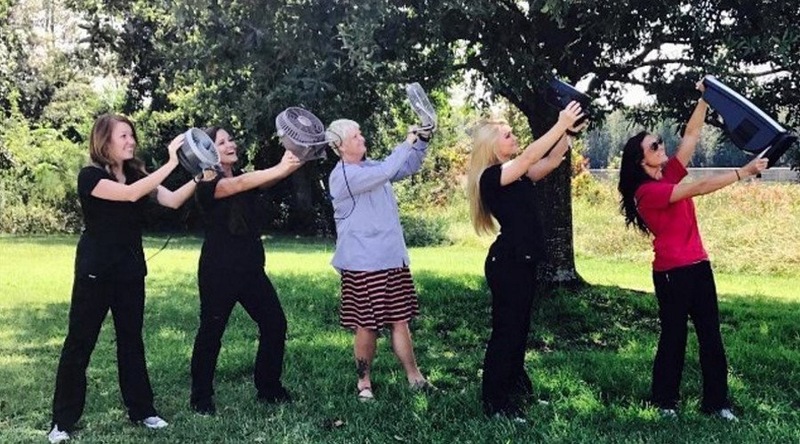 There is an absolutely fabulous video put together using that music to a “T”. My hat is off the the genius who put together the 2016 election night results from various news sources: “The night 63 milion deplorables saved America from crooked Hillary.” There are similarities. Meteorologist Joe Bastardi said much the same back in 2012 when at ICCC7. At about the 27 minute onward he spills the beans on what really happens. Warmunistas love attempting to blind people with science. It don’t impress me much. Five scientists, working in different parts of the world, bear witness to some of the dramatic changes to our planet that have occurred in their lifetimes, as the global climate warms. The Northwest Passage is opening up. Bird populations in the UK have collapsed with more exotic species arriving from the south. Coral reefs in the Caribbean have been destroyed. New viruses are surviving and thriving in a warmer world. That’s just part of the intro – ‘dramatic, collapse, destroyed, viruses’…pass the sick bag. I think they really believe it! That is even more frightening than it being a deliberate con. Not sure if my radio will survive listening to the BBC’s usual balanced and open exposes of the damage caused by AGW: might have to give it a miss!